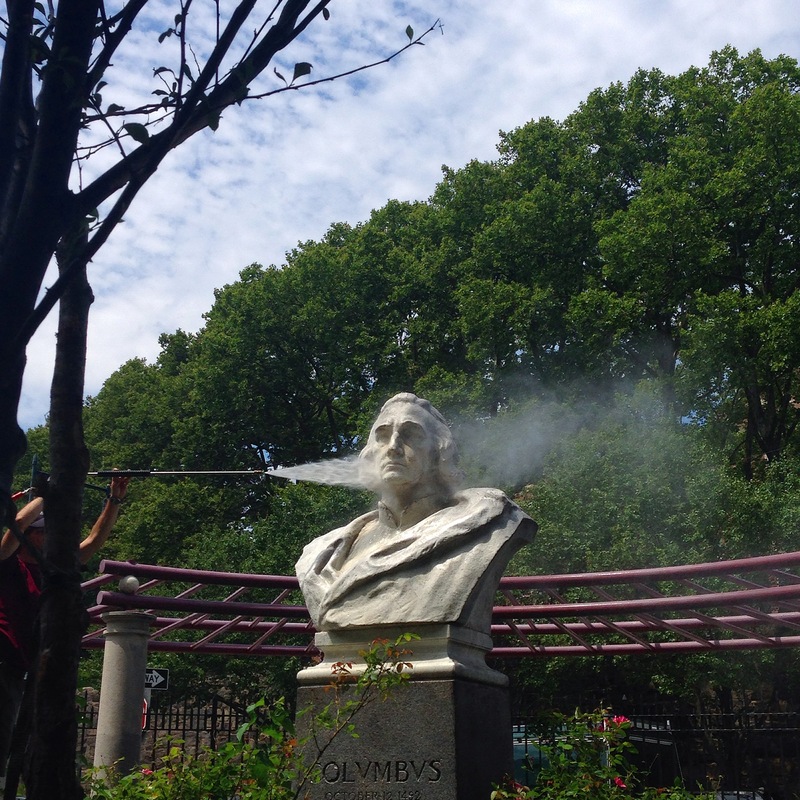 Working for the New York City Parks this summer as a conservation intern, has given me insight into the physical labors of hands-on outdoor restoration. Tasks varied from routine maintenances, either dealing with environmental soiling or minor graffiti. Bronze was power washed, soaped, dried, waxed and buffed (with exceptions based on previous coatings) while stones were power washed, soaped and scrubbed with Orvus, a non-ionic soap, and rinsed again. Washington gets a high- pressure bath. Washington Square Arch, New York City. Over the course of the internship, we had about 3 Major projects. 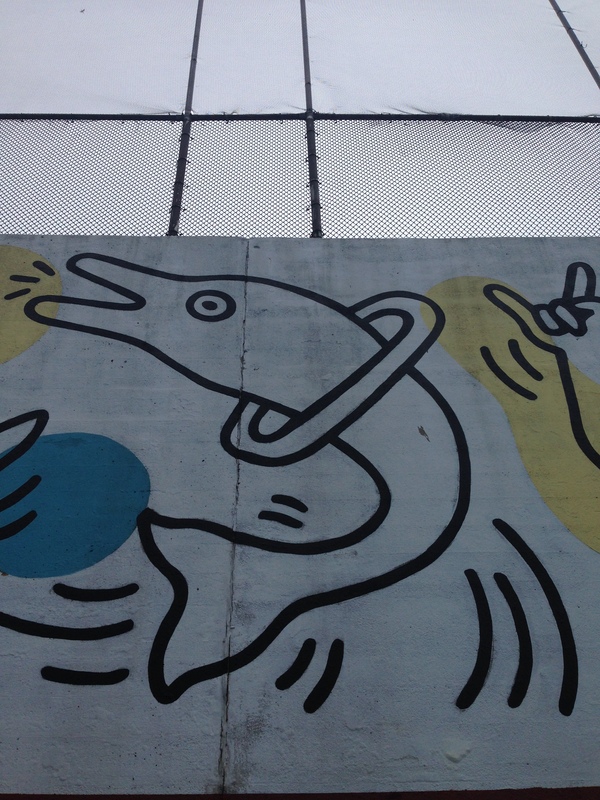 The first one was the conservation of the Keith Haring mural at the Carmine Street pool in the West Village. 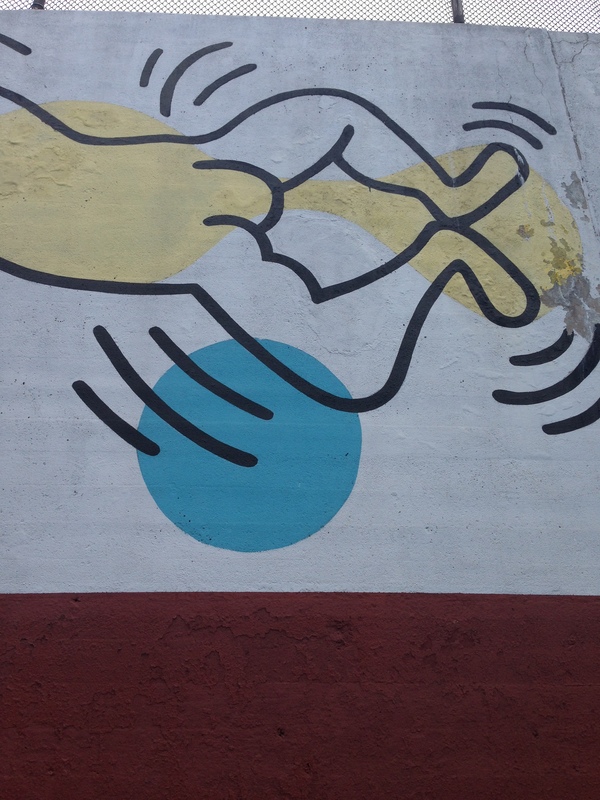 The mural had paint peeling, corrosion from the rust and needed patching. Close up of paint failure. Carmine Street pool, New York. Working with the masons to patch the water damaged areas, and a painter from the Haring Foundation, we managed to finish the project in under a week. 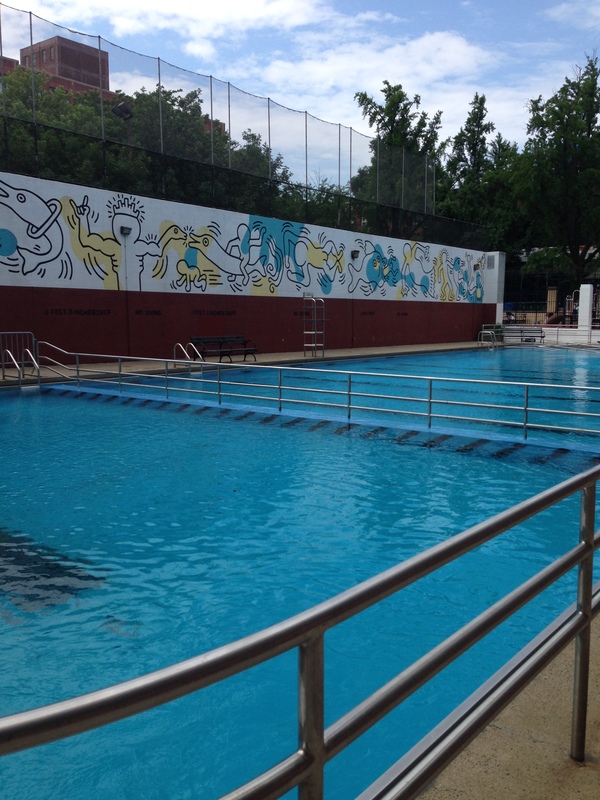 After cleaning, patching and repainting of Carmine Street Pool. 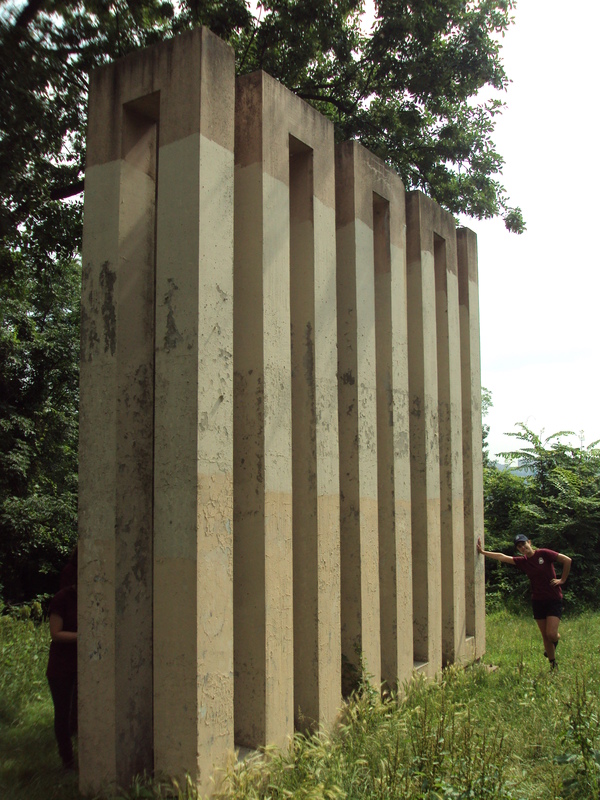 Our most arduous project was at Fort Tryon Park, restoring “Columnade” a sculpture by Edwardo Ramirez Villamizar, a Columbian artist, whose work resamples a 25′ radiator. 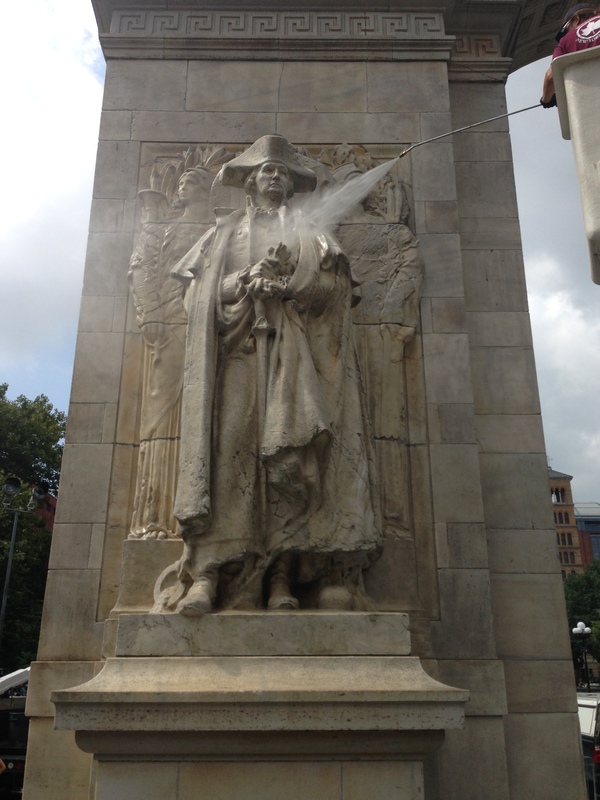 Made of cast concrete, the sculpture has been both graffitied and painted over several coats, making the removal a very arduous and TOXIC process. Using warm water at a high pressure, paint stripper and sand blasters, the layers of paint finally came off after several hours dedicated to this project. Getting geared up to use a very toxic paint remover. An early shot of Columnade, after several days of paint stripping, graffiti and paint layers still evident. The base of the structure was entirely rusted and exposed. We removed the rust with hammer and chisel, which took several hours of the course of many days. Once the rust was entirely removed, we prepped the base for the masons to fill with concrete. 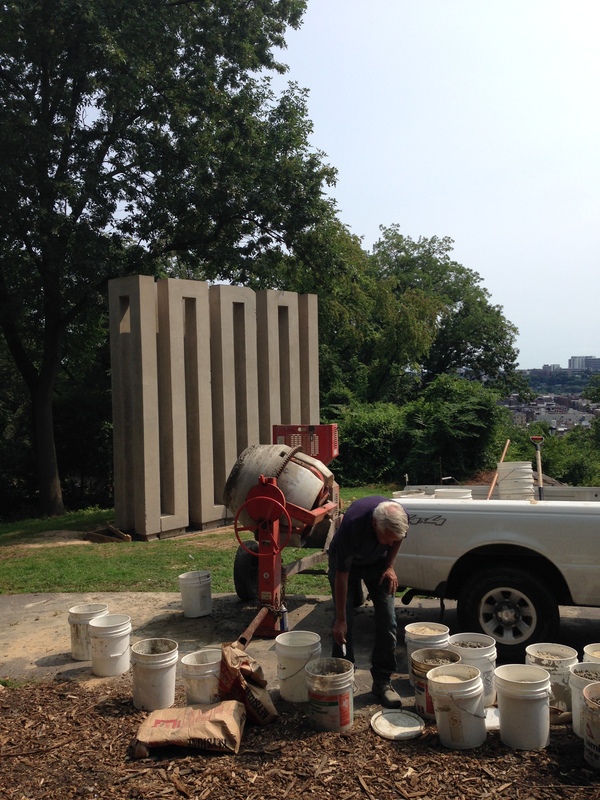 Final touches on Columnade as mason prepares a new concrete base for the sculpture. 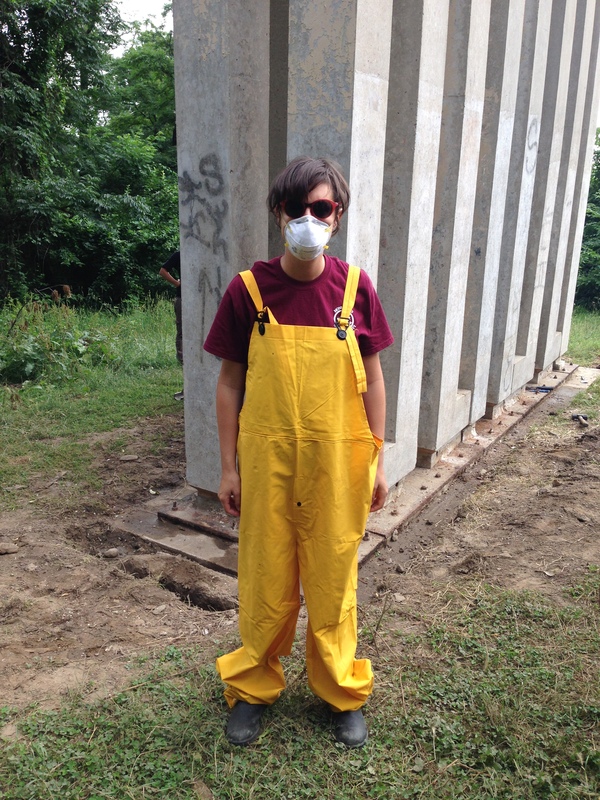 This internship was so unique because of the technical skills I learned, and the unique perspective it gave me on the city’s parks and public art, and the extent of maintenance the common person does not acknowledge. However, I did come across very fundamental questions of preservation ethics, for instance, while unearthing graffiti from the 1970s, I struggled with the familiar Ruskinian concepts of “bringing back the dead.” Other days, I would think why am I re-laquering this man who was so influential in the slave trade? Even though all preservationists have some moral dilemmas at one point or another, my job this summer was not to decide whether or not to preserve these monuments, but HOW to maintain them. I was in a sense saving a snapshot of history, and it is not the monument that should not be honored, but the interpretation perhaps revisited. Viollet-le-Duc would have perhaps saluted me in my summer’s endeavors.